Every fall, Annapolis, Maryland is inundated with an ocean of boats and hopeful sailors during the world’s largest boat show. There are actually two shows; one for sailboats and another, held a week later, for powerboats. As a former resident of the Chesapeake Bay region I know these events to be orgies of nautical consumerism. There are lots of pretty boats, but I have no interest in attending either event. Boats were everywhere. They ranged from the elegant to the eccentric. 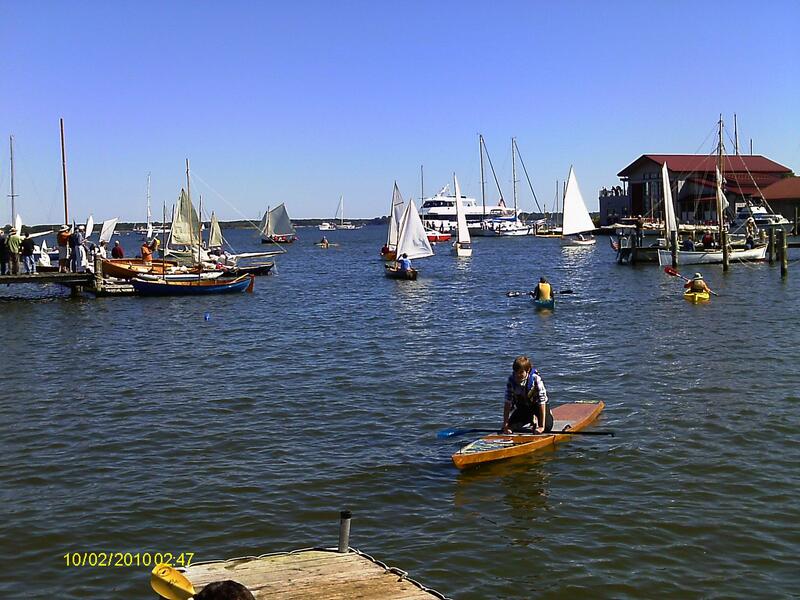 But on the other side of the Chesapeake Bay, in a small inlet on the edge of the Eastern Shore, there is a much smaller, quieter and convivial gathering wooden boats. In its 23rd year, the Mid-Atlantic Small Craft Festival is a low-key celebration of wooden boats, most built by their owners. It’s held in early October on the grounds of the scenic Chesapeake Bay Maritime Museum in an equally scenic Eastern Shore town of St. Michaels. For more than a year, I had planned to finish by Pocket Cruiser in time to attend the event with my shiny new boat. I envisioned a dramatic entry into the museum’s pier, sails full, cabin stocked with provisions, under the admiring gaze of my fellow builders. I was fully confident that the festival would be one stop on my triumphant Chesapeake tour—and the culmination of my eighteen-month building adventure. But to my surprise and dismay, October arrived without a finished boat. After making fast progress for much of the summer, work nearly ground to a halt by early fall. I’m irritatingly close to completion; all that remains are sails, rigging, and hardware. But I’m temporarily defeated by—of all things—an old car and my unsuccessful search for a trailer. More than I year ago, I installed a tow bar on our family minivan in preparation for pulling my boat to the water. Meanwhile, an acquaintance had promised to sell a sturdy trailer for a very good price. “Pick it up anytime!” he said more than a year ago. I felt that everything was in place. But when I was finally ready to put the boat on the trailer, the offer was rescinded. A frantic search ensued for a comparable trailer in the classifieds and Craigslist, but without success. I briefly considered buying a kit trailer, but learned that registering and titling a home assembled trailer in my state was both expensive and bureaucratically complex, erasing any financial advantage. Finally, I resigned myself to buying a new trailer—they seem to run around $700—from a local marine store owned by an unpleasantly abrasive man with a yard full of jet skis and power boats. The words resonated as I drove away: “We need each other.” What a wonderful sentence. People should say things like that to each other more often. But his diagnosis magnified my problems. Now I didn’t have a way to tow a trailer, even if I had a trailer, which I don’t. Our other car–an ancient Subaru that I love dearly but trust not at all—didn’t come with the required tow bar and it would cost about $400 to get the Subaru fully equipped. Along with the $700 for a trailer and another $100 for registration and titling, the cost required to get my boat to the water reached an unpleasantly high figure of $1,200 or more. Could I justify this expense at a time when I should be looking to buy a new car? And did I mention that the gods of self employed writers have been withholding their favors recently? I immediately decided that I just had to keep my priorities straight. The boat could wait; it had to wait. And once I made that mature decision, I immediately went through the five stages of grief. But within a matter of minutes, after I had worked through the list, I decided to not accept my fate. Impulsively, I decided that if I couldn’t afford to get the Pocket Cruiser in the water during the waning days of fall, I would build something that could. In other words, I would build another boat. The requirements were simple. It had to be easily built, very inexpensive, and capable of being car-topped. The easy answer to these requirements was a plywood canoe. Many hours of idle Web surfing over the past two years had acquainted me with multiple plans for super-simple canoes and kayaks quickly assembled from one or, more typically, two sheets of quarter inch plywood. After a few minutes of research I settled on the widely built “six hour canoe,” which is described in a small, affordably priced book by the same name. A couple of canoes. The "six hour" canoe is on the left. It's like my canoe, only better. A lot better. All of these events took place over the past month, but I was reluctant to reveal my detour until I had nearly finished the canoe. I didn’t want to look like a flake who filled his garage with unfinished boats. But I’m an obstinate (if irrational) man and I worked on the canoe nearly every day. I quickly learned that the canoe’s name is a gross misnomer; as a moderately experienced builder, I can say with confidence that it is not possible to really build this canoe in six hours. I’m now ready to sand the hull and apply the paint, but it took about eighteen hours of work to get here. That’s not a lot of time, of course, especially when compared to my “simple” pocket cruiser. But it’s not—and cannot be—a real weekend project. Too much time is required to let glue set and epoxy harden. 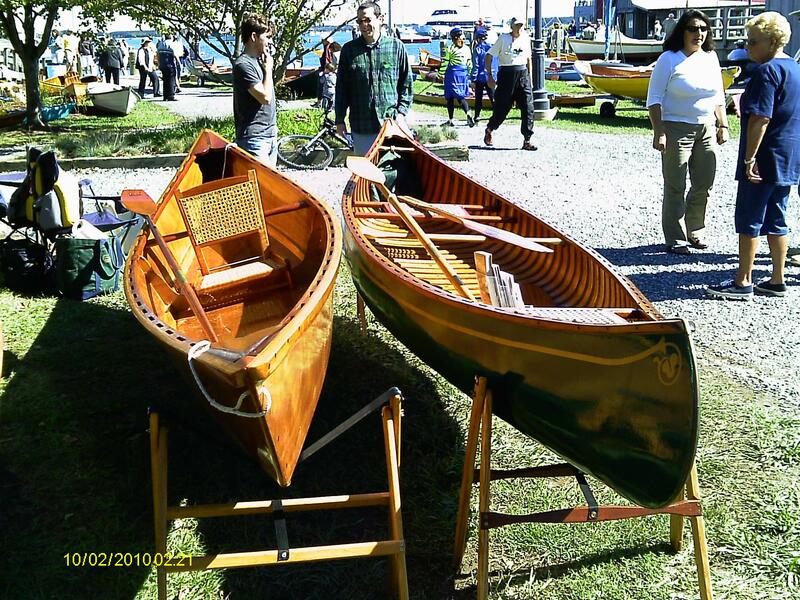 But the only real disappointment to emerge from the delayed completion of my Pocket Cruiser and my unexpected shift to a canoe was that I could not make my triumphant entry at the small craft festival in St. Michaels. Two boats—both close to completion—sat side by side, but on the appointed day, I had to drive down to the Eastern Shore, pay my museum admission fee, and enter through the main gate, just like the other boatless, wannabe sailors. The Pocket Ship, a pocket cruiser designed by Chesapeake Light Craft. But disappointment faded as I entered the pearly gates of wooden boat heaven. Dozen of boat filled the waterfront, nearly all homemade and each one shinier than the next. In the water, canoes, kayaks, day sailers, and one or two pocket cruisers (but no Pocket Cruisers) zipped back and forth, nearly colliding and, occasionally capsizing. I was joined by my oldest son—the one slowly building his own small sailboat—and together we started our explorations along the Avenue of Canoes (or so it seemed) where steam bending is de rigueur and every builder had mastered the arcane art of rattan seat-making. Strolling along, I noticed a familiar looking plywood canoe. Where had I seen it before? I mused, as I ambled past. Was it featured in a magazine or did I see it on a builder’s forum? But then I looked again and realized that it was, in fact, a six hour canoe—but not like the one I’m building. Constructed of okume with fancy gunwales and—yes—the obligatory rattan seat, it was the Deluxe version of my humble canoe. Stopping to inspect the craft and take some pictures, I struck up a conversation with Al, its experienced builder, who is affiliated with the Chesapeake Wooden Boat School—more of an amateur builder’s cooperative, from what I can tell—affiliated with the Havre de Grace (Maryland) Maritime Museum. It occurred to me that this was my first face-to-face conversation with an experienced boat builder. 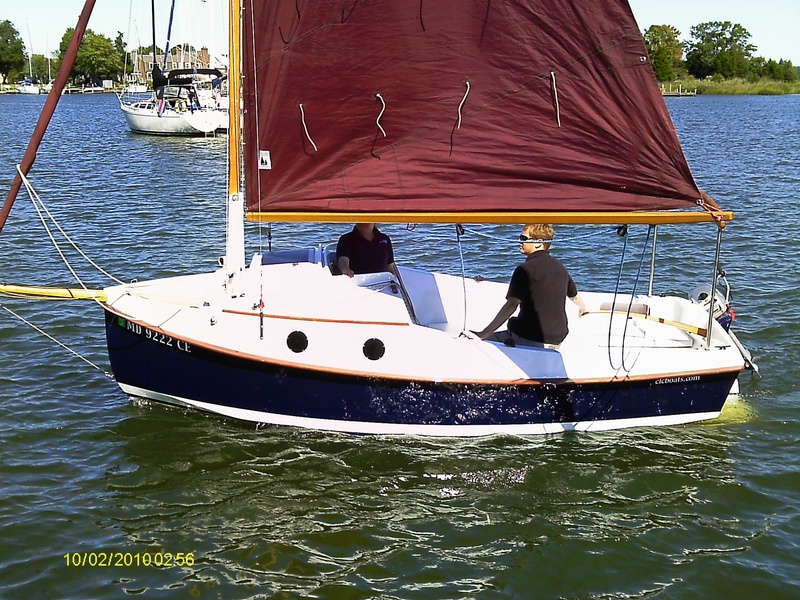 After nearly two years of on-line correspondence through boat building forums, I was, at last, actually conversing with a real honest-to-goodness builder who really knew what he was talking about. And I learned two things right off the bat. First, I discovered that I had been mispronouncing okume for more than eighteen months. I called it something close to “Oh-koom”, but I noticed that Al pronounced it “Oh-koo-may.” It’s the kind of mistake made by a person who learns his craft from books. I also noticed that you learn a lot more when you can talk to a real person in real time. How many times had I pushed my literary skills to the limit, trying to explain in writing a problem I was having with the placement of my bilge board boxes or the application of fiberglass? Countless times I just wanted to drag my fellow builders out of cyberspace and into my garage where I could say, “See? This thing here doesn’t fit. What should I do?” Now, at last, I could point, ask questions, and get instant answers. There’s no real substitute for face-to-face conversation. And—here’s the third thing I noticed—it’s a lot more fun to talk with real people. Until now, I never really felt part of the boat building “community” and part of me wondered what my fellow builders were really like. Aside from this one shared interest, were they people to whom I could relate, or were they people I would avoid at a party? To my great pleasure, I discovered that they are unfailingly nice people—engaging, articulate, and fully socially appropriate. They might think I’m strange, but I felt right at home. The afternoon passed quickly. We watched boats come and go, including a small pocket cruiser called a Pocket Ship that is nearly identical in size to my boat, but considerably more sophisticated in design (although, I should add, not as pretty). We also toured the Chesapeake Maritime Museum, which features old Chesapeake workboats–sturdy, functional craft well suited to the Bay’s shallow waters. The museum also builds boats on commission and provides classes and apprenticeships for aspiring builders, including an innovative “apprentice for a day” program that requires nothing more than $35 and a free afternoon. The current project is a nearly completed skiff. We eavesdropped on a conversation between one of the instructors and a few visitors and learned, among other things, that this traditional craft—assembled from expensive oak and cedar—is glued together with Titebond III, not epoxy. This piqued my interest since I have followed the ongoing debate over the durability of this relatively new waterproof glue. Many people assert on the forums I read that Titebond III—found in any home center–is fine for boats that aren’t intended to last, but cannot be trusted for long term durability. But the museum’s instructor told me that they have used it for over five years and have never had a failure when used in conjunction with brass screws and framing. By 5 p.m. the museum was closing and boats were being put away. My son and I returned to our car and drove—not sailed—back our home, but I didn’t really mind. I’ll be back next year with my Pocket Cruiser, the canoe or, maybe, both. 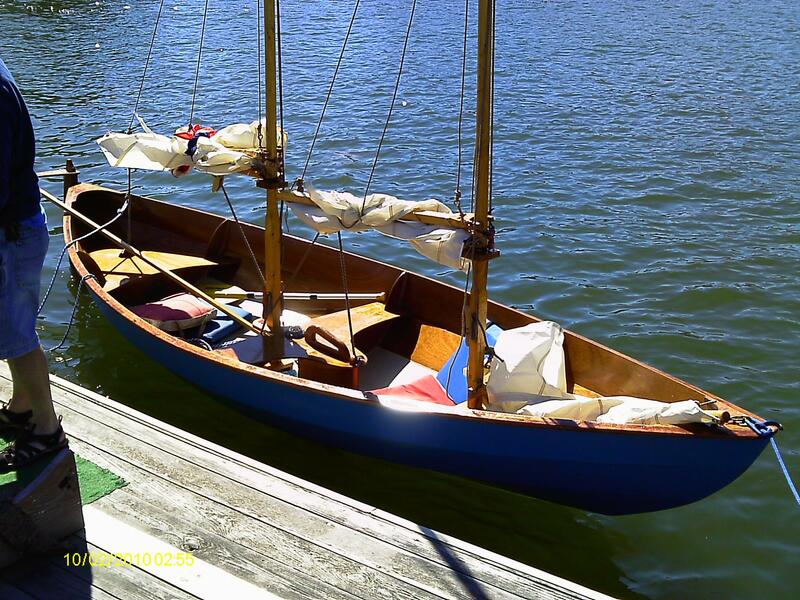 You are currently browsing the Build a Boat, Sail Away blog archives for October, 2010.